“Any bank can be good in good times. 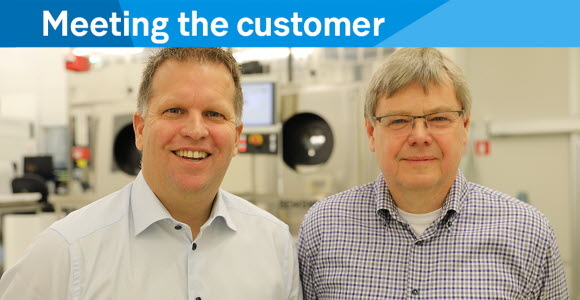 It’s when times are tough that you really need a good banking relationship – a mutual trust and understanding for your business,” says Edvard Kälvesten, CEO of Silex Microsystems, one of the world’s largest manufacturers of microelectromechanical systems. The company, with 200 employees and sales of SEK 530 million in 2018, is a pure-play producer of microelectromechanical systems (MEMS). These are advanced semiconductors which, in contrast to ordinary semiconductors, also feature integrated mechanical functions. The company’s founder, Edvard Kälvesten, earned a Ph.D. in this technology in the late 1990s. He was then asked by a Swedish medtech company to develop and MEMS-based medical pressure sensor for the coronary artery. This became the foundation of Silex Microsystems, which was established in 2000. After a few years in which operations were conducted out of KTH Royal Institute of Technology’s lab in Stockholm, the company set up operations in new premises in Järfälla, outside Stockholm. The company has grown by about 20 per cent per year, but in strictly financial terms it has weathered a few shaky years, 2008-2009 and 2012-2013. The company has operated in the black since 2014. Today profitability is good and confidence in the future is strong. Edvard Kälvesten confirms that the company is going full-throttle, while also building up a buffer in order to have resilience in the event of any future downturns. But isn’t it hard to conduct industrial production from Sweden? Silex Microsystems is a so-called MEMS foundry, which means it does not have any products of its own, but develops and designs MEMS products from the bottom based on its customers’ needs. Customers are in all types of industries, from medical technology to the automotive industry and consumer electronics. In 2011 the company conducted a bank procurement process and met with all of Sweden’s major banks. Due to a tough financial situation, it wasn’t a good time to switch during that year, but in 2015, when the tide had changed and all curves were pointing up, the company chose to switch to SEB. What is the most important factor in a banking relationship?